The strength of the covalent H2 bond over a range of chemical and thermodynamic environments is of great interest. At extremely high pressure, hydrogen is expected to form a metallic phase and exhibit high temperature superconductivity. Despite these features, metallic hydrogen remains elusive as the pressures thought to be required to create it are outside current experimental capabilities. Recent work has suggested that hydrogen dominant materials (e.g., methane, silane, germane, etc.) may undergo insulator to metal transitions at significantly reduced pressures when compared with pure hydrogen. Recent experimental reports have suggested that silane (SiH4) transforms into a metal around 60 GPa and displays superconductivity at 100 GPa and 17 K.
Researchers at the Geophysical Laboratory, led by postdoctoral fellow Tim Strobel, have revealed a new hydrogen dominant material with indication for molecular hydrogen bond weakening at extremely low pressure when compared with bulk hydrogen. 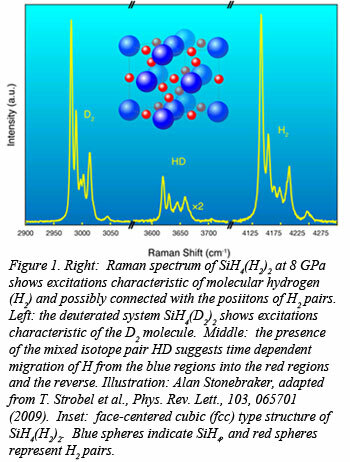 By pressurizing mixtures of SiH4 and H2, the Carnegie group discovered the formation of a new compound, SiH4(H2)2, that displays abnormally strong intermolecular interaction. 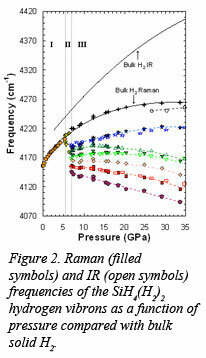 Raman and infrared spectra (Fig. 1) of the new compound revealed an anticorrelated pressure-frequency dependence of the hydrogen vibrons, indicative of covalent H2 bond destabilization (Fig 2). Starting at only 7 GPa, this phenomenon is remarkable when compared with solid H2 where the IR vibron does not soften until pressures well over a megabar. 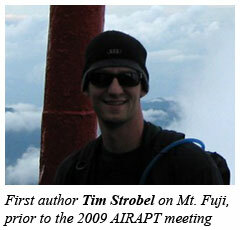 The results of this work, published recently in Physical Review Letters [T. Strobel, et al., Phys. Rev. Lett., 103, 065701 (2009)], point to unusually weak hydrogen covalent bonds, and the possibility of metallization at pressures far below that of pure H2. A related study will be published by the CDAC group at Stanford [S. Wang, et al., Proc. Nat. Acad. Sci., in press]. The implications for unusual chemical bonding, metallization and superconductivity that arise from the recent synthesis of SiH4(H2)2 have been described recently by N. W. Ashcroft [Physics, 2, 65 (2009)], points out the importance of this new material to both experimental and theoretical investigations into the nature of hydrogen at high densities. To read N. W. Ashcroft's full commentary, follow this link.